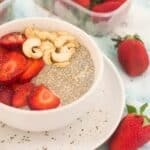 Vanilla chia seed pudding – this delicious pudding is made from chia seeds, coconut milk, nectar with a hint of vanilla extract and strawberry topping. A simple chia seed recipe that consists of less than 5 ingredients – filling, irresistible and incredibly tasty. 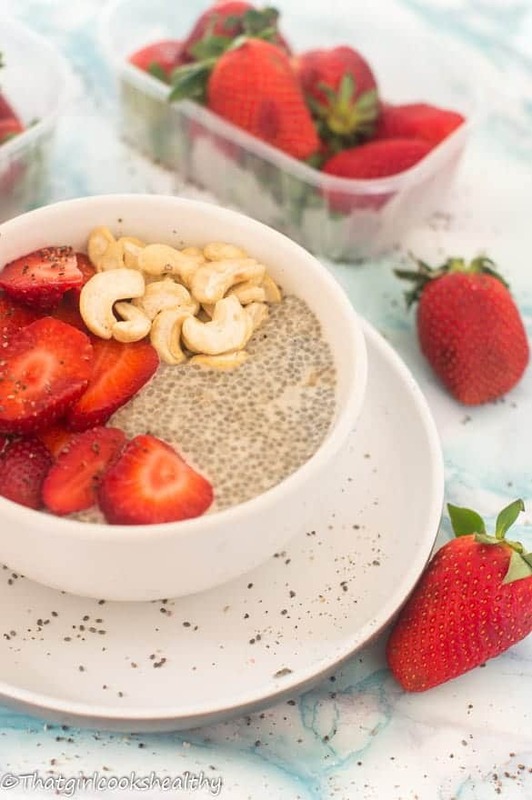 This vanilla chia seed pudding is one that I’ve been eating for a few weeks now because the nearby markets are currently selling strawberries which I like to pair with vanilla at a reasonable cost. I consider this recipe to be a breakfast and pudding in one and that is the best part about it. The ambiguity offers my readers the opportunity to choose as and when to eat it. 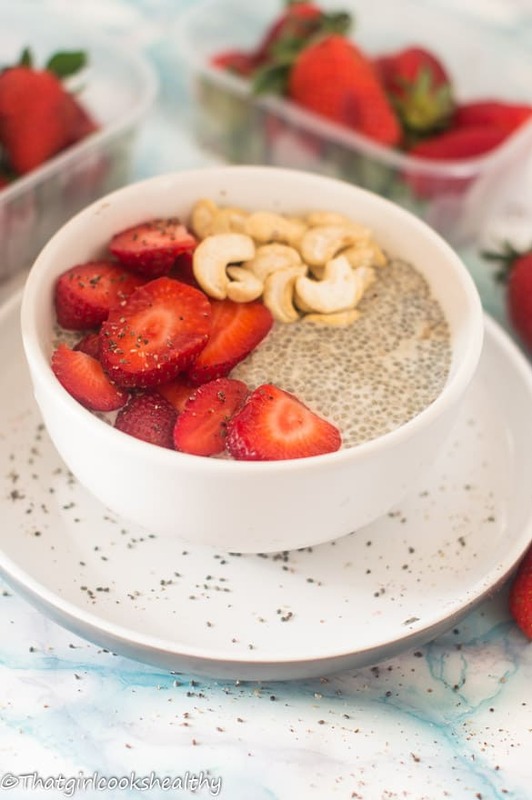 It’s quite filling so breaking that all important fast with some chia seeds is certainly what is needed if you’re looking for a recipe that is tasty and will keep you full for at least a few hours. 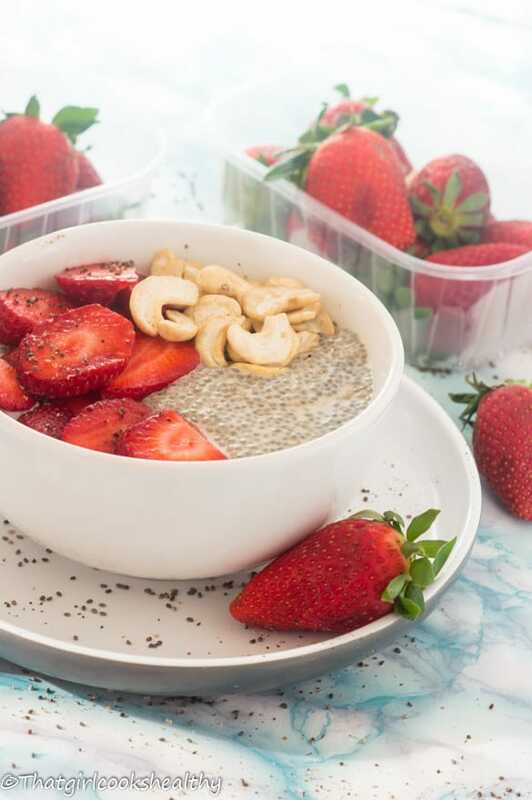 You should make vanilla chia seed pudding because………..
On the contrary, these nothing quite like coming home to some chia seed pudding or perhaps you’re in the mood for a not-so-naughty-treat. Let me echo these sentiments once again, this chia recipe can quickly turn into the dessert of your dreams. 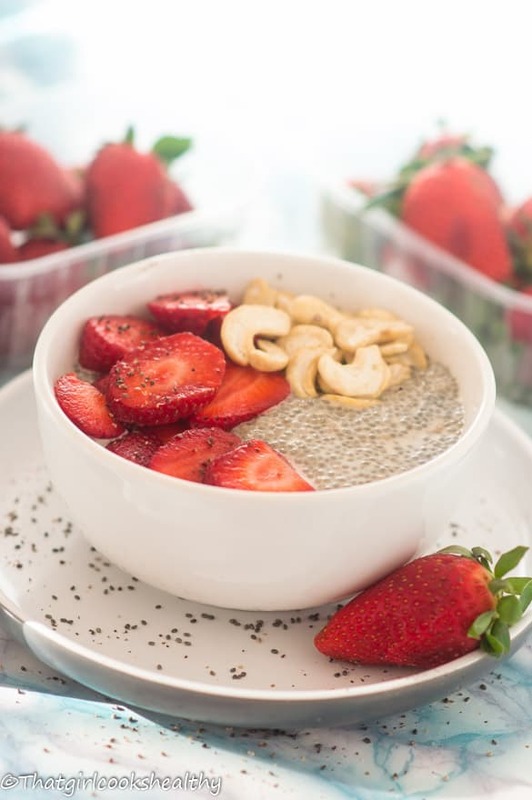 The key to a good chia seed pudding is………. Whisk the chia seed in a bowl to allow the seeds to expand into little transparent balls. I have discovered that whisking the seeds with nut milk helps to hasten this process so there is no need to wait several hours or overnight unless of course you’re not in a hurry to eat it. Pour the nut milk onto the chia seeds whisking briskly. The seeds won’t expand immediately, so whisk periodically it should reach its peak within 15 minutes, whisking at 2-3 minute intervals during this time feel free to drizzle in the coconut nectar and vanilla. Once the pudding has reached its peak, adorn with the sliced strawberries. Serve accordingly – dessert or breakfast. Seeing recipes like yours, really inspires me to continue to cook with healthier ingredients. I use a lot of almond milk now but have not tried chia seeds. Thank you so much for your kind words Peter I am glad to be an inspiration to you and hopefully others too. Almond milk will work wonderfully with chia seeds, definitely give it a try and see for yourself. What a tasty and healthy looking breakfast! Like Peter, I’m always trying to include more healthy foods in my diet and recipes like this really help. And, as far as life goes, balance is important. Thanks Annemarie. I appreciate how difficult it can be to commit to what maybe deemed as a healthy lifestyle…HOWEVER by making small changes to your diet will make all the difference. This looks like the perfect way to start the day! I think it’s amazing how a little bit of vanilla can trick the taste buds into thinking ‘sweet’ even when there’s no sugar added. Such a delicious looking pudding! Love the combination of strawberry and vanilla. I make something similar for my toddlers. They love it! Looks very good! Thanks for sharing! You’re welcome and thank you for commenting April. Haven’t shown you comment love in a while Charla! 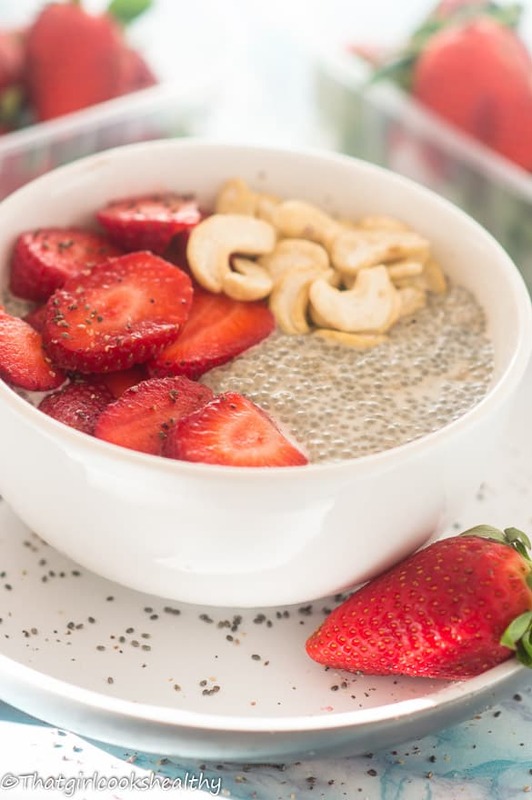 Love me some chia pudding – it’s probably one of the only things I use chia seeds for lol! Yay!! So glad you and co enjoyed the recipe, another hit!